Biomass equations are a helpful tool to estimate the tree and stand biomass production and standing stock. Such estimations are of great interest for science but also of great importance for global reports on the carbon cycle and the global climate system. Even though there are various collections and generic meta-analyses available with biomass equations for mature trees, reports on biomass equations for juvenile trees (seedlings and saplings) are mainly missing. Against the background of an increasing amount of reforestation and afforestation projects and forests in young successional stages, such equations are required. 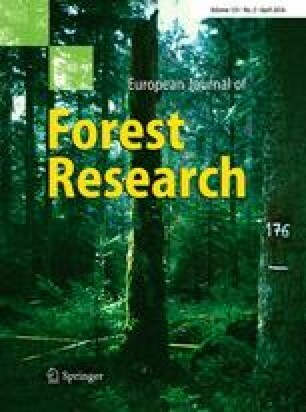 In this study we have collected data from various studies on the aboveground woody biomass of 19 common tree species growing in Europe. The aim of this paper was to calculate species-specific biomass equations for the aboveground woody biomass of single trees in dependence of root-collar-diameter (RCD), height (H) and the combination of the two (RCD2 H). Next to calculating species-specific biomass equations for the species available in the dataset, we also calculated generic biomass equations for all broadleaved species and all conifer species. The biomass equations should be a contribution to the pool of published biomass equations, whereas the novelty is here that the equations were exclusively derived for young trees. Communicated by Miren del Rio. We thank the national research project “Ecosystem Services of Natural Forests at Forestry and Climate Policy (FKZ 3511 84 0200),” from the Federal Agency for Nature Conservation (BfN) of the Federal Ministry for the Environment Nature Conservation and Nuclear Safety (BMU) for funding this project. We are also grateful for the technical assistances and support in the field and laboratory by (working group Ammer) Ulrike Westphal, Andreas Parth, and Michael Unger; (working group Löf and Bolte), Tomasz Czajkowski, Thomas Kompa, and Heiko Rubbert; (working group Scherer-Lorenzen) Sigrid Berger, Felix Berthold, Stephanie Kätsch, Joanna McMillan, Vlad Tataru, and Stefan Trogisch; (working group Balandier) Virginie Chirent and Ludivine Guinard for helping with the seedling excavation; (working group Kändler) wished to thank Rainer Kruse for conducting the field sampling. The BIOTREE sites Bechstedt and Kaltenborn are maintained by the Federal Forestry Office Thüringer Wald (Bundesforstamt Thuringer Wald), and we also wish to thank them. Caquet B, Barigah T, Cochard H, Montpied P, Collet C, Dreyer E, Epron D 2009 Hydraulic properties of naturally regenerated beech saplings respond to canopy opening. Tree Physiol. 29:1395–1405. Collet C, Löf M, Pagès L 2006 Root system development of oak seedlings analyzed using a root architectural model. Effects of competition with grass. Plant and Soil, 279: 367–383. Müller S (2014) Unpublished data, Dissertation: Architectural light foraging syndromes of juvenile temperate broad leaved trees. Albert-Ludwigs Universität Freiburg.